To many, living a greener life is understood to be needing to take drastic measures in one's life to make a difference. As Americans and the top consumers in the world, we waste and over-consume so much that the options available to us to improve our environmental impact are virtually limitless. Even the smallest behavioral changes we make as a society will have a positive effect on a greener world. For those uncomfortable giving up the beloved SUV or carpooling to work, there are literally thousands of more "comfortable" ways to reduce your footprint on the world. The key is to start somewhere...anywhere. CNN.com hosts a great 'mini-site' to buying (and living) a greener life - suitable for all those "maybe gonna do it"s out there. A handy primer I found insightful is entitled Disposable Culture. It lists in a very digestible manner, the top ways our culture of convenience and disposal is impacting the environment. Got any favorite tips of your own? Share them with us - we'd love to hear them. It is pretty easy to see that some of the most popular blogs out there are celebrity gossip blogs. There is Prez Hilton, Socialite Life, Defamer, and our office favorite Pop Sugar just to name a few. Everyday thousands of people partake in the guilty pleasure of being voyeurs into the lives of celebrities. But there is a new site out there that takes the time to call out celebrities that are using their status to promote environmental and social issues. "Ecorazzi exists to highlight the people making this effort for the environment." So if you are into celebrity gossip and would like to see who is doing what to help our planet, check it out. They even give links to celebrities who have started eco-websites. My sensors have been in hibernation for a bit, but when a close friend suggested I take a look at what Gap is doing in Lesotho, I perked up. I spent two years in Lesotho – it’s a tiny, beautiful, mountainous country landlocked inside South Africa. I’m still in love with the place and miss it more as each day passes. I heard that they recently found a 600 carat diamond in one of Lesotho’s mines, but the only exciting thing about that was a co-worker mentioning that he heard about Lesotho in the news! This Gap thing, though…I’m in! The problem with being a good environmental steward is that so often it goes against the fabric of our naturally, consumer-driven ways. Being good to the earth takes effort and often we have to go out of our way to do it. Tackling the "lazy" mindset is a challenge for anyone trying to make an impact, which is why we love the Ecopod, a design driven appliance crafted to make recycling simple and rewarding. Aside from its sleek look, borrowing more from high-end kitchen appliances than a trashcan lineage, the Ecopod is functionally smart. It incorporates a foot-pedal operated compressor that crushes recyclables and collects them in bins that can hold between 50-60 crushed containers. There's also separate area that can hold glass bottles, newspapers, plastic bags and other materials. It's a one-stop recycling center housed in a Jetson-esque look. Though it'll be a challenge keeping the estimated 130 billion containers from going into U.S. landfills this year, the Ecopod can at least make the process rewarding and....hey, a little cool too. Actor, Leonardo DiCaprio is developing a new reality TV series focusing on the environment. "E-topia" will focus around an American town, yet to be disclosed, as it undergoes an eco-transformation. The intent is to create an enviro-responsible role model community. Each episode will end in a call to action for viewers to learn more about how they can can participate in environmental initiatives. According to US Census Bureau projections, America's population will hit 300 million at 7:46 a.m. EDT today. The Bureau's population clock at the time of this posting was 300,002,170. We at method recently picked up this blog posted in late September off of a site called The Good Human. In it, the author compares method and Seventh Generation, a competitor (if you wish to call them that) of ours. The entry entitled Method vs. Seventh Generation - let the battle begin! focuses on the environmental profile of each company and which one is better than the other. The evolution of trash. First there were garbage cans, then there were recycling bins, and now we have composting containers. Many people compost on their own in their own back yard but here in San Francisco we have a little thing called industrial composting. Industrial composting enables residents to have their compostables picked up the same way the trash is. Once a week the "garbage collectors" drive around the city collecting compost placed in special bins and then take it to a facility where everything is broken down into soil to sell to local vineyards. 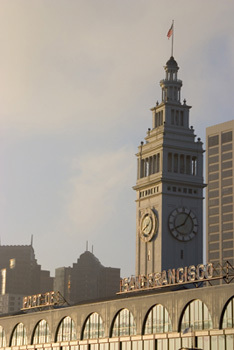 San Francisco is one of the few major US cities that offers municiple composting pickup. I just started composting myself and am amazed at how much I don't put into the trash can anymore. But individuals are not the only ones who can compost. Businesses are also taking the cue. Here's a novel thought - what if, when your old household electronics and appliances became obsolete, you could just call the manufacturer and have them pick it up? Sounds impossible, right? Well, now Dell Computer is now offering free recycling a for its products. Dell will pick up any obsolete Dell computer or peripherals at no charge, even if the replacement isn't a Dell. And, if you buy a new Dell computer, they'll offer to recycle your old non-Dell PC. This program was announced by Michael Dell in June and went into service in the US in September. Global rollout will occur in November.